The sound barrier has been breached by a privately built rocket-plane, the first time it has been done without government help. 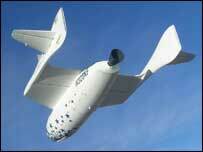 Scaled Composites of California flew their SpaceShipOne rocket-plane at Mach 1.2 to an altitude of 68,000 ft. The company is run by Burt Rutan, who was behind the Voyager aircraft that flew non-stop around the world without refuelling in 1986. Analysts say that SpaceShipOne could reach space on a mission next year. It was in 1947, 56 years ago, that Chuck Yeager made the first supersonic flight in the Bell X-1 rocket under a US Government research programme. Since then, many supersonic aircraft have been developed. But all of them were produced by large aerospace companies, with extensive government backing. On the day of the 100th anniversary of the Wright brothers' 1903 flight, a small craft called SpaceShipOne demonstrated that supersonic flight is now possible by a small company working without government help. It also represents an important milestone in Scaled Composites' ambition to win the X-prize, to be awarded to the first non-governmental body to launch a manned spacecraft into space. To go supersonic, a launch aircraft called White Knight carried the research rocket-plane SpaceShipOne to 48,000 feet (14,600 metres) altitude, near the desert town of California City, US, where it was released. SpaceShipOne then flew into a stable gliding flight before starting a pull-up and firing its rocket motor. Nine seconds later, it broke the sound barrier and continued its steep, powered ascent. At motor shutdown, 15 seconds after ignition, SpaceShipOne was climbing at a 60-degree angle and flying near Mach 1.2 (930 mph or 1,500 km/h), reaching 68,000 feet (20,700 metres). 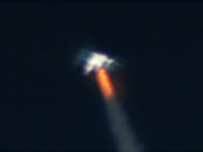 At the top of its climb, SpaceShipOne was in near-weightless conditions, emulating the situation it will encounter during its planned sub-orbital missions. After descending for about a minute, it flew a 12-minute glide to landing at Mojave airport. Scaled Composites does not announce its future missions in advance but experts say it can only be one or two flights away from an X-prize attempt, which may occur next year. The X-prize is $10m for the first privately funded, non-governmental body that can launch a three-person spacecraft into space twice in two weeks.